This is more true than ever today, as the atomic half life of brand communication continues to shrink, victimized by algorithmic masters that dole out attention like Pez. The massive flood of content created every second of every day about every topic and happening results in overwhelming competition for attention, as has been well-documented by Mark Schaefer, and others. The important part of this definition is “breaking news story.” The intent of newsjacking as originally conceived is that your brand’s angle is the second paragraph in traditional media coverage of whatever is happening. The actual story is paragraph one. Newsjacking was published in late 2011, and became deservedly popular, especially among public relations practitioners who saw it as a reliable recipe for merging long-lead story pitching with real-time earned media. Just fifteen months later, however, the now-legendary Oreo Dunk in the Dark tweet was sent. With one tweet, Oreo and their agencies ushered in the era of “real-time marketing,” and “RTM” disciples rushed to set up Twitter war rooms to capitalized on every trending hashtag. This shifted the notion of newsjacking from a way to get earned media coverage to a way to get more likes and shares on owned social media outlets. In short, Oreo’s Dunk stunt moved newsjacking from a PR tactic to a social media tactic. This post from the Get Spokal blog illustrates the outcome. Nearly every one of their 15 newsjacking examples is a tweet, and essentially none show evidence of earned media coverage whatsoever (other than perhaps trade press talking about the clever tweet, thereby earning ego points among marketing peers, but not creating any real business value). I am not a fan, and have never been a fan, of this kind of marketing. (In fact, my post “17 Mostly Failed Brand Tweets from The Oscars” is still one of the most-read posts in the history of this site.) For more, here’s a short video rant on why most brands are trying to hard to be clever, in real-time. Minimal impact. Even done well, do these real-time tweets create customers or keep customers? It feels so often like social media marketers doing marketing for the enjoyment of other social media marketers, and we don’t play that game at Convince & Convert. But all is not lost for the newsjacking premise. Today, it is easier than ever to create on-trend content in nearly real-time. With everyone carrying around a mobile production studio in their pants at all times, there’s not much excuse for not being able to produce content on the fly, beyond inertia and corporate process obstacles. Further, with the one-click availability of live video, creating reaction content that inserts your angle into a breaking news story is as easy as making a sandwich (maybe easier if you insist on using a panini press). If desired, more ways to promote the newsjack with paid. Given that most social media newsjacks are on Twitter, your options for paid are… Twitter. With a content marketing newsjack, you can use paid Twitter, Facebook, IG, Linkedin, SEM, display, etc. 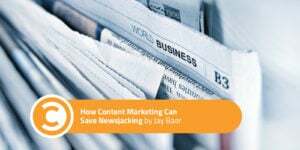 You do not need to be a big brand with an in-house video studio to engage in this form of content marketing as newsjacking. In fact, from a nimbleness perspective, I might argue that you’re better off being a small and scrappy business that can turn on a camera and record without sign-offs and hand wringing. Dr. Tim Wood of Mission Family Chiropractic in Kelowna, British Columbia is a terrific small business example of content marketing newsjacking. This year, the Kelowna area—the major city in Canada’s Okanagan region—has received a tremendous blanket of snow, far more than is typical for this area. Local media scrambled to cover the storms, with advice and counsel for local residents and visitors. It’s a useful, safe, three-shovel approach that I’m going to try next time we get a lot of snow here in Indiana! KelownaNow.com is a large digital media platform for the region, and when this year’s snows rolled in, they discovered Dr. Wood’s video and promoted it on their site, and in their social media. If and when your newsjack succeeds, re-amplify it yourself. This is the one flaw I see in Dr. Wood’s execution, as he did not re-post the video to his own social channels, even after it was picked up in the press. Newsjacking was originally about earned media through real-time public relations. It was co-opted by social media to become more about “riding the hashtag” but that has limited upside and potentially large downside, in my estimation. Instead, since we now have the ability to make credible content marketing (especially video) instantly, use that opportunity to pursue a newsjacking strategy that is rooted in content marketing, with social media as the amplification layer. Big hat tip to my friend Jan Enns for bringing this case study to my attention, via a Linkedin post.